City government in New Amsterdam had met in the Dutch Stadt Huys, built as a tavern in 1642 on Pearl Street, then known simply as The Waterside. 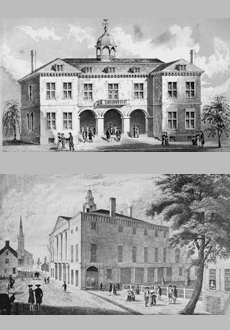 After the British takeover, in 1703, a new building, seen in the upper image, was constructed to serve as City Hall. Together with Trinity Church and the First Presbyterian Church, City Hall gave weight to the dignity of the west end of Wall Street. After the Revolutionary War, in 1788, Pierre L'Enfant, who was best known for his later planning of the new capital city of Washington D.C., designed the renovation and enlargement of City Hall, which became knows as Federal Hall when it housed the Continental Congress. The balcony served as the location of the inauguration of George Washington as the nation's first president on April 30th, 1789. The nation's capital moved to another temporary home in Philadelphia in 1790 and the building resumed its previous function of city hall until the current City Hall was constructed in 1812.